Now that you already know the high impact of the employees’ procrastination on the organization performance, you do not need to go through the Risk Assessment and Risk Management Strategies Analysis, meaning Avoid/Eliminate, Retain, Reduce/Modify, or Transfer. The only sound strategy to mitigate procrastination is Avoid/Eliminate as shown in figure-1, or at least the Reduce Strategy. 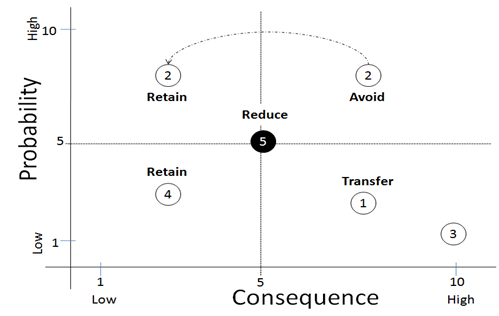 The reason that we have selected the Avoid or Reduce Strategy is that both, the probability of the risk occurring is high (close to 10), and the consequence, the impact on the organization is high (close to 10). The above processes and tools are used as part of the selected risk mitigation strategy. And the activities to be used in preparing the Risk Mitigation Plan are derived. Activities in the Mitigation Plan include a set of review tasks, to review the goals and activities that the employee supposed to achieve/complete during the week against the planned completion dates. And actions to be taken if these goals and tasks are not completed on time as well as the resources responsible for the review and actions. The mitigation plan needs to be reviewed with the employee and his supervisors and managers. 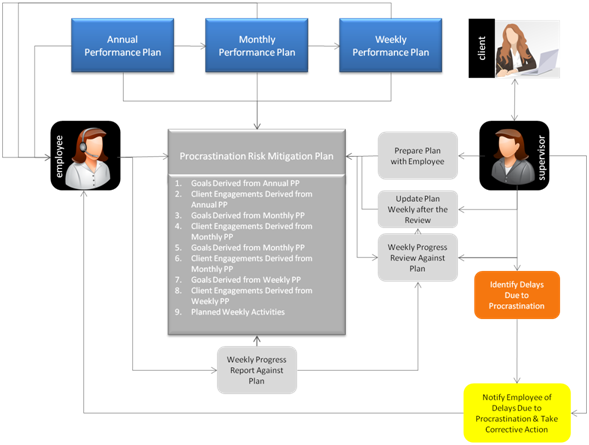 Execution of the plan consists of conducting the mitigation activities defined in the plan and taking the mitigation actions if events are occurring that may lead to the occurrence of the procrastination risk. Such events include identifying delays and the cause of the delays and meeting with the employee to identify the causes of delays to ascertain that the delays are not due to the employee procrastination. The plan need to be reviews and updated weekly and shared with employee and his/her supervisor and manager, so the employee is aware of the risk and the actions that need to be implemented to avoid the risk. Interact HRMS provides a comprehensive Risk Management (iRisk) solution combined with Performance Management, and Project Management which will enable any organization to implement an effective Risk Management solution to solve the problem of Employee Procrastination and other risk associated problems. 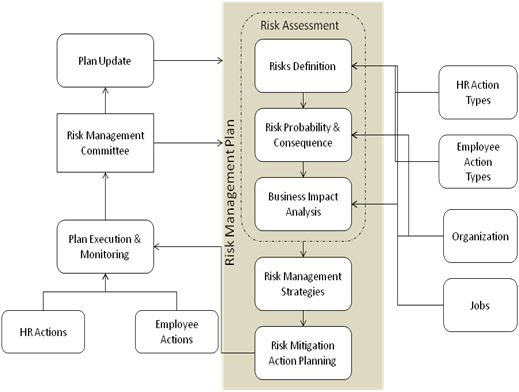 The basis of the Risk Management Planning framework are Risk Assessment, Business Impact Analysis, Management Strategies, Risk Mitigation Planning, Action Plan Execution & Monitoring, and Acton Plan Update as shown in the Risk Management Planning Framework, Figure-3. As you are reading this blog, and if you do not have the right processes and tools in place to mitigate employee procrastination, your organization/company is losing thousands of dollars every week due to employee procrastination and highly likely losing sales opportunities, client satisfaction is degrading, and your organization is not meeting its performance goals. Interact HRMS with it seamlessly integrated Risk Management, Performance Management, Client Management, and Project Management applications/solutions can provide you with the right approach, technology, and solution to implement and deploy the right and effective solution to eliminate or drastically reduce the Employee Procrastination Problem, leading to drastic cost savings and financial and operational performance improvements.